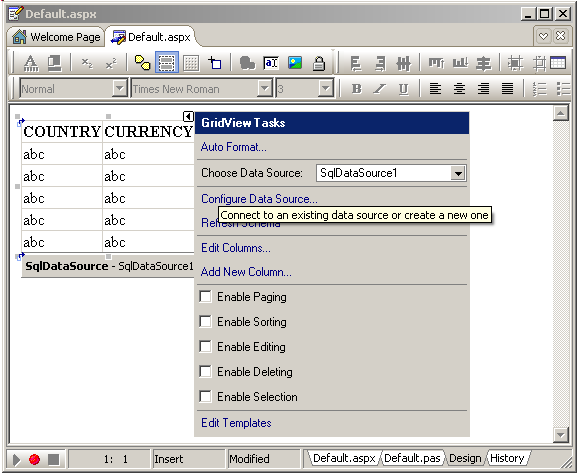 Delphi Asp.Net 2.0 Databases - Felix John COLIBRI. 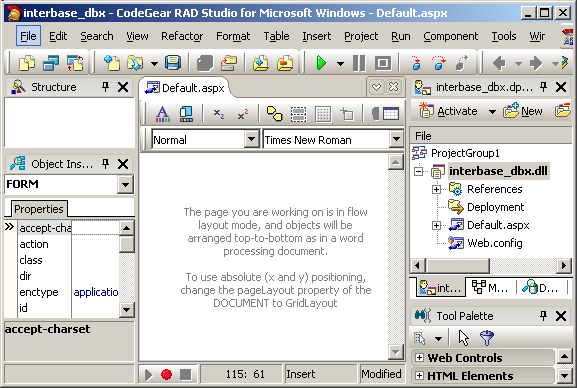 With Rad Studio, we can develop Asp.Net application, and the purpose of this paper is to present how to acess Sql engine data in order to display them in Asp.Net pages. 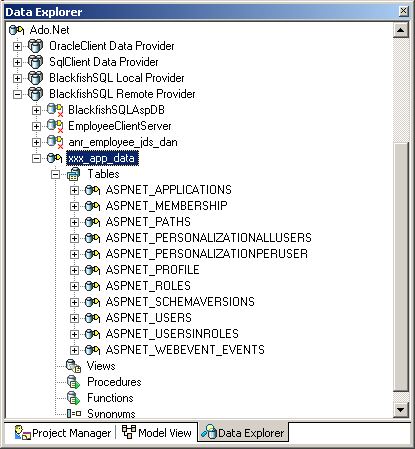 Ado.Net introduced the "Data Providers" for database access. In Win32, the basic idea was to build generic layers, like the BDE, dbExpressDataSnap, Ado or Zeos, which would let the developer use the same components and code, irrespective of the target Sql Engine. Of course Microsoft did not take too much time to build a specific Data Provider for Interbase. For Delphi 8 (and for the next versions as well), we, could use OleDb, wich like other OleDb stuff left the developer alone to find somewhere the correct connection string (usually googling around long enough to find someone who published the string with all those magic values). 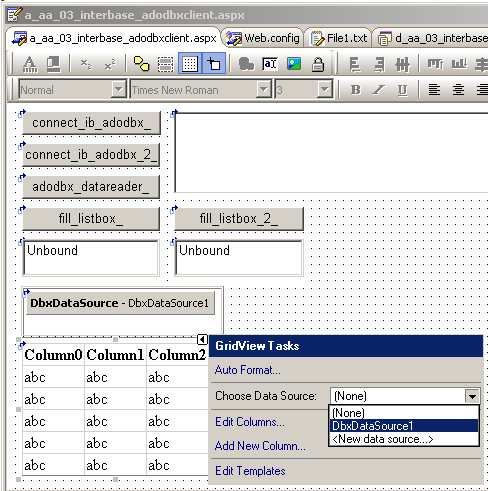 With Delphi 2005, Borland offered a Data Provider of their ow, the BDP (Borland Data Provider), which we could use to access InterBase, and also all other databases. 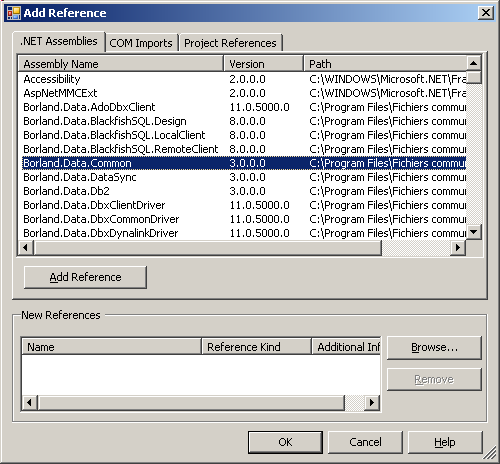 One could use this bona fide .Net Data Provider with any kind of .Net compliant language (Prolog, Fortran) to access some database. 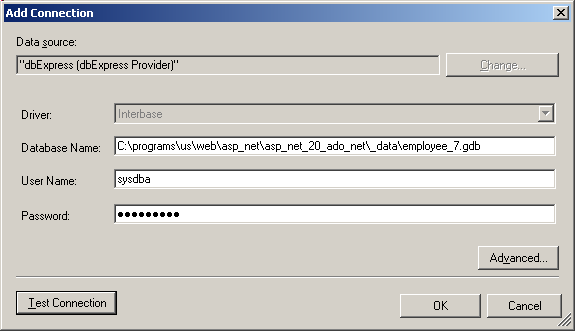 At the time, we published several articles telling in detail how on could use this BDP with InterBase, Firebird etc. With Ado.Net 2.0 the situation on the .Net side is very similar: there are still separate providers for Sql Server, Oracle, OleDb and ODBC. 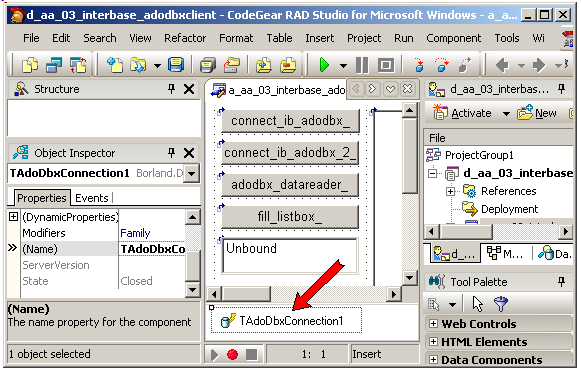 The first two are present in the Rad Studio Data Explorer, under the Ado.Net node. 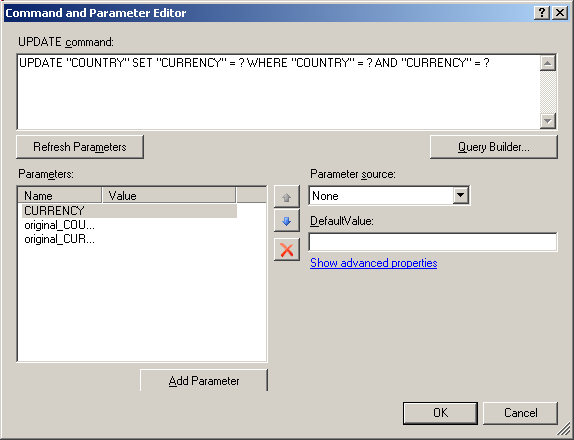 The BDP node was completely removed from the Data Explorer, and the BDP is considered "deprecated". 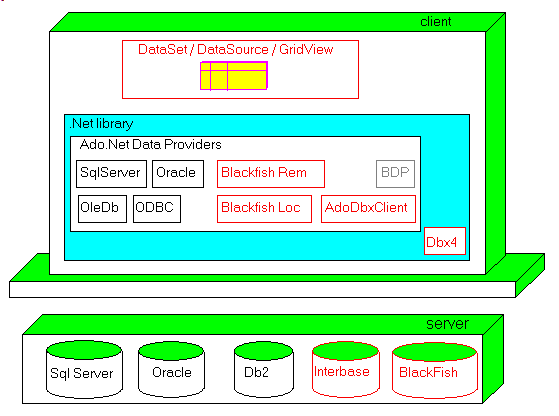 To replace the BDP, CodeGear introduced the AdoDbxClient, which is a new Ado.Net provider implementation that we can use to handle all Sql Servers available with DbExpress: InterBase, MySql, etc and Blackfish as well. 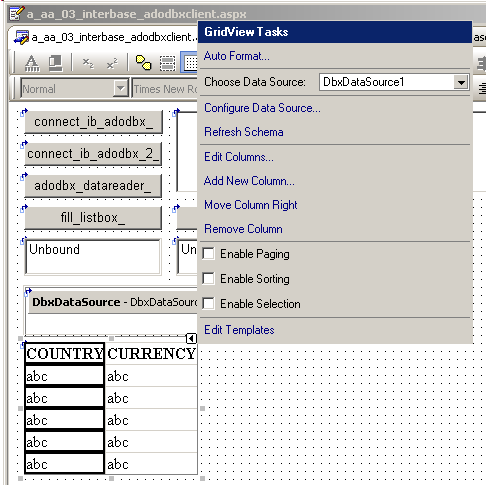 This AdoDbxClient uses the new low-level DbExpress 4 (Dbx4 for short) driver layer, and we can use the Dbx4 components to connect to databases and execute Sql statements. 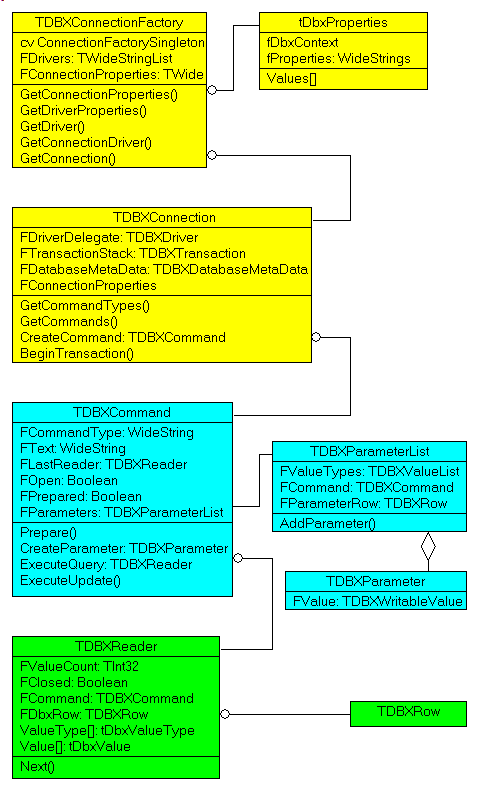 We have presented this kind of programming in the Delphi Dbx4 programming article. we will also show how we can use the low-level Dbx4 components, mainly for code handling (no databinding to Web Controls). 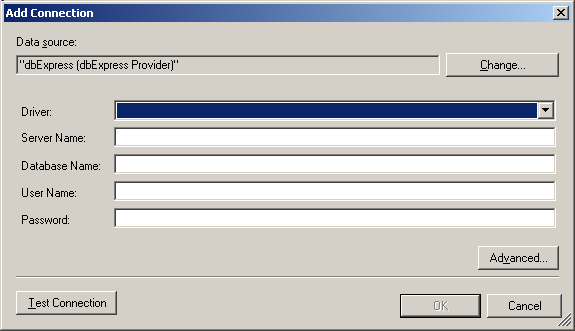 Once we have selected a Data Provider, we will use the component set of this provider. 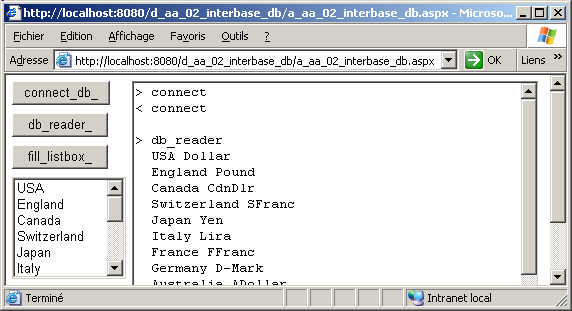 As explained before, we can use the DbxConnection, DbxCommand, DbxDataReader driver-level access components to read and write data, even from Asp.Net. 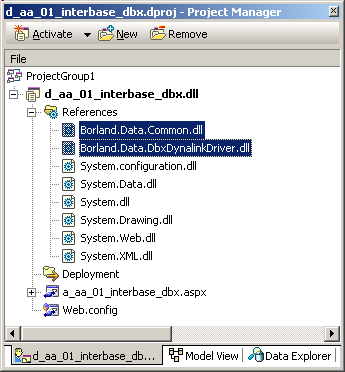 select the top-right pane, the Data Explorer tab, select "DbExpress | Interbase | Add new connection"
select "File | New | Asp.Net Web Application"
in the Project Manager, select "interbase_dbx | References | right click | Add Reference"
select Borland.Data.Common.Dll and Borland.Data.Dbx.DynalinkDriver.Dll and click "Add Reference" and "Ok"
if you do not add the references, the project still compiles, but you will receive a "Unable to cast object of type 'Borland.Data.TDBXDynalinkDriverLoader' to type 'Borland.Data.TDBXDriverLoader'", which, of course, means "add the DynalinkDriver reference"
we cannot "Open" the tDbxConnection. Creating it automatically calls a PROTECTED Open. we started to implement some helper routines, like the f_c_dbx_connection function which will at the end be placed in a helper unit. if we try to link the tDbxReader to a WebControl_xxx.DataSource, we will receive the following error message: "must be either an IListSource, IEnumerable, or IDataSource". A more general approach would be to use Ado.Net compatible components, which will allow us to bind our access components to the bindable Web Controls. select "Data Explorer | INTERBASE | DBX_EMPLOYEE_7_IB_DAN | right click | modify connection"
Since we cannot use the connection name, we used the connection string. we placed the connection string required by the Ado.Net provider in a CONST. We were very surprised to receive an error because this string was greater then 255 Characters. Well it's nearly since the time of the Apple ][ that we had not seen this message ! This explains why we did split the string in two. and then we also had to add the password to the connection string, since it is not in the "Advanced Properties" label. 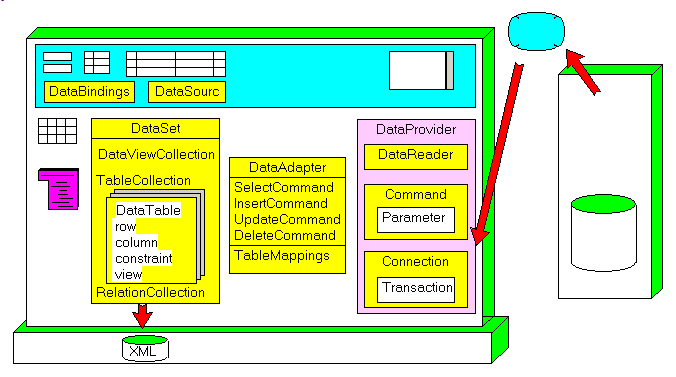 the DataBind technique is the old Asp.Net 1 technique. We are now supposed to use DataSources, and this will be demonstrated below. The old technique still works however. In addition, when we use DataBind, we can select when to do the binding (when NOT Page.IsPostBack, for instance), and avoid doing this at each round trip, and we might even disable the ViewState. We will not develop those very common Asp.Net techniques in this article. 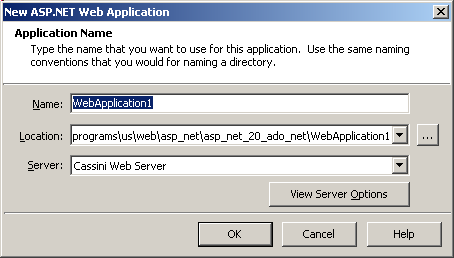 The third route is the AdoDbxClient Ado.Net provider. 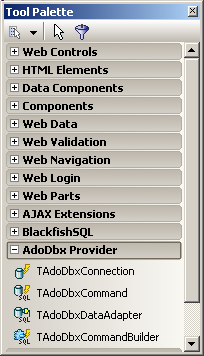 This brand new component suite was created to have the Ado.Net provider for all the Dbx accessible Sql engines. We have the full source code, and in addition it works for both .Net and .Win32. 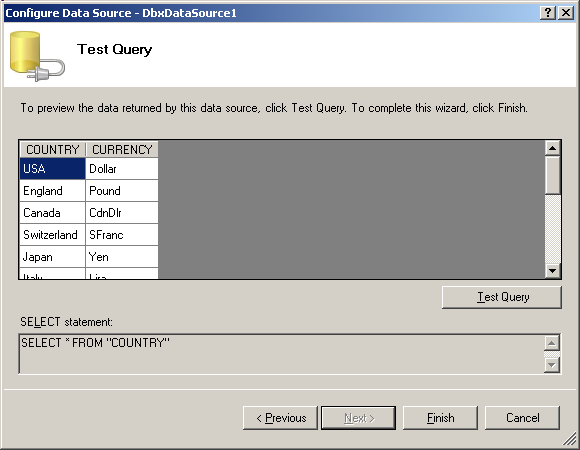 drop a tAdoDbxCommand, set its Connection property to AdoDbxConnection1, and its CommandText to some Sql request, like "SELECT * FROM country"
the AdoDbx_xxx objects have a funny T before the component name. 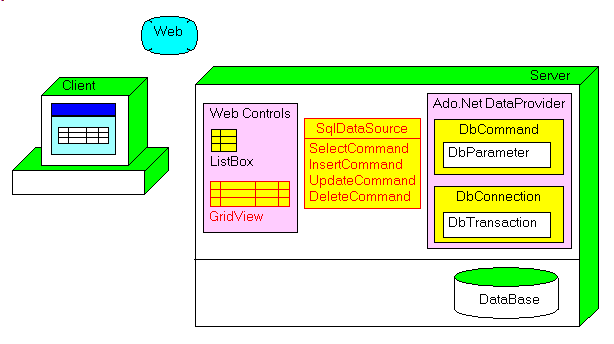 One of the main innovation of Asp.Net 2.0 is the DataSource technique. 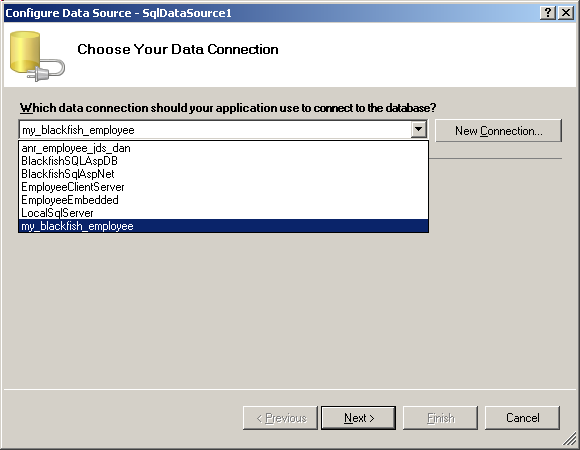 Instead of calling DataBind to fill the Web Controls, we use the new DataSource component and this component takes care of the databinding part. 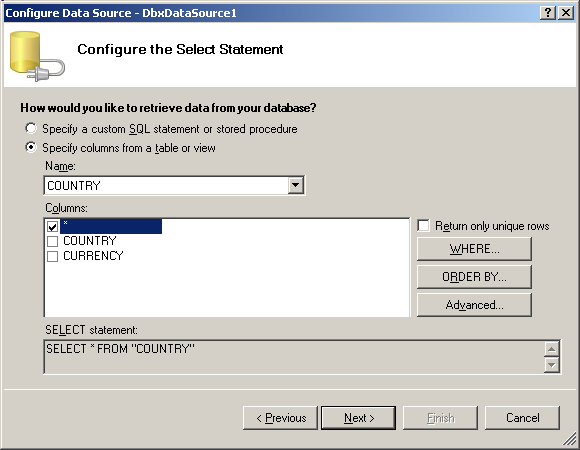 select "dbExpress" and click "Continue"
fill this dialog and click "Ok"
either type your request, or select "specify colums", select the table and the columns and select "Next"
click "Test Query" and then "Finish"
select "Choose DataSource | DbxDataSource1"
select "smart tasks | Choose DataSource | New DataSource"
when we accepted to "save the connection in the configuration file", it was saved in the Web.Config file. 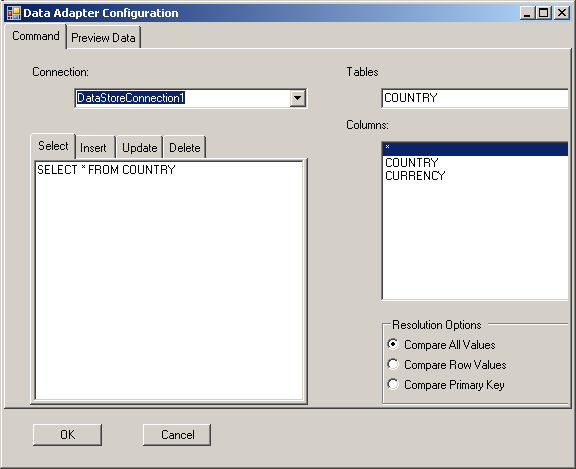 If you now try to use another connection, those connections will be presented along with the Ado.Net connections already presented in the Data Explorer. You may also notice that each entry has a name connectionString and providerName attribute. We will use those to set the connection later in this article. 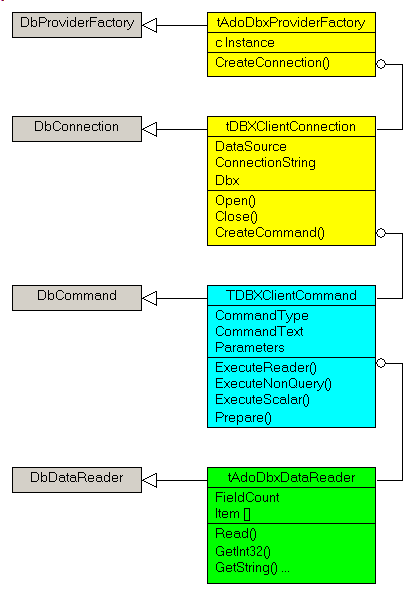 As we already presented in the Blackfish Sql paper, we can use the DbxConnection, DbxCommand, DbxDataReader driver-level access components to read and write data, even from Asp.Net. 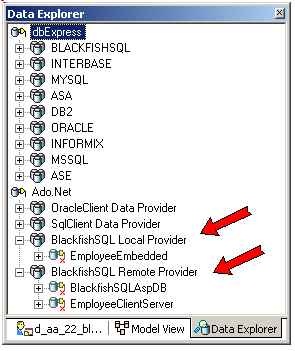 select the top-right pane, the Data Explorer tab, select "DbExpress | BlackfishSql | right click | Add new connection"
in the Project Manager, select "blackfish_dbx.dll | References | right click | Add Reference"
select the top-right pane, the Data Explorer tab, select "Ado Net | BlackfishSql Remote Provider | rigth click | Add new connection"
We could fill a ListBox from the DbDataReader, as we did with the InterBase example. 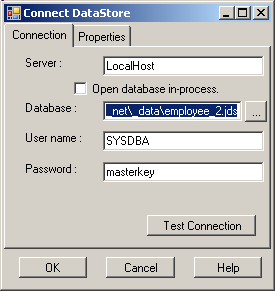 The "DataStore" is the new generic name for the CodeGear embedded database. 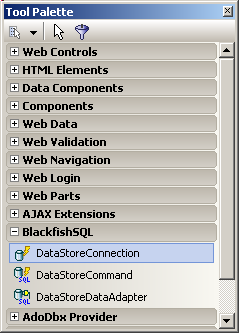 This all started with JDataStore (a Java thingy), and was rewritten for .Net and renamed NDataStore and later Blackfish. So the "DataStore" comes from those times. 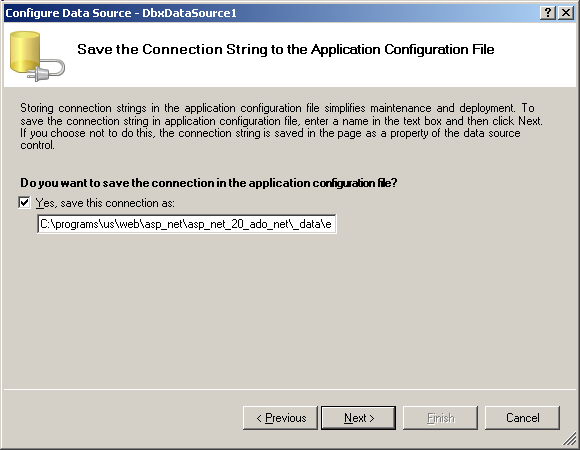 select "Object Inspector | Connection String | ellipsis"
select the employee_2.jds, test the connection and click "Ok"
in the component tray, select "DataStoreDataAdapter1 | right click | configure Data Adapter"
add the connection, select the Table, the rows and click "Generate Sql" (on the right, in the truncated part). 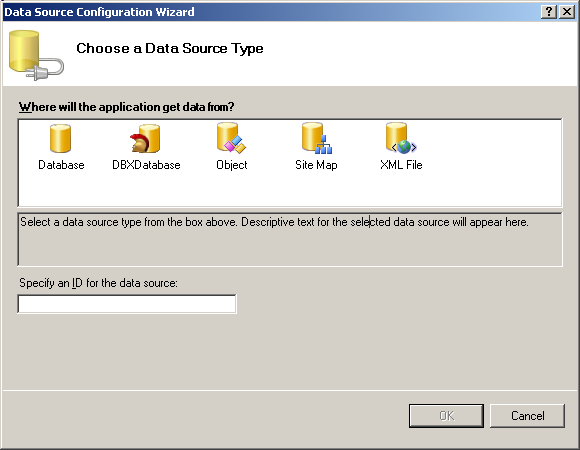 select "Tools Palette | DataComponents"
you cannot create a DataSet from the "Configure DataStore" dialog (like we could do with Windows Forms). But since we still need to call DataBind, this is not very important. 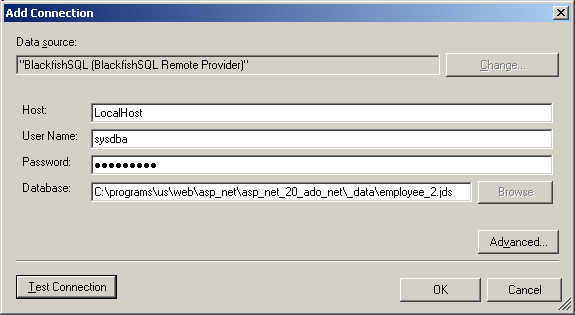 We can also use the new Ado.Net 2.0 SqlDataSource to automatically bind some Web Controls to our BlackfishSql database. 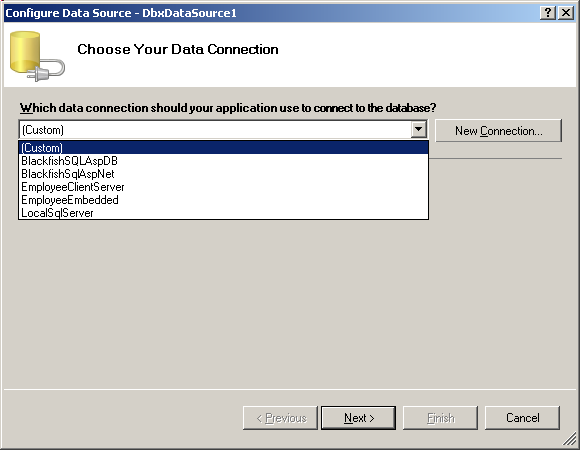 And this time, we can use the original SqlDataSource, since the BlackfishSql data types are aligned to the .Net data types (which is not the case for InterBase). 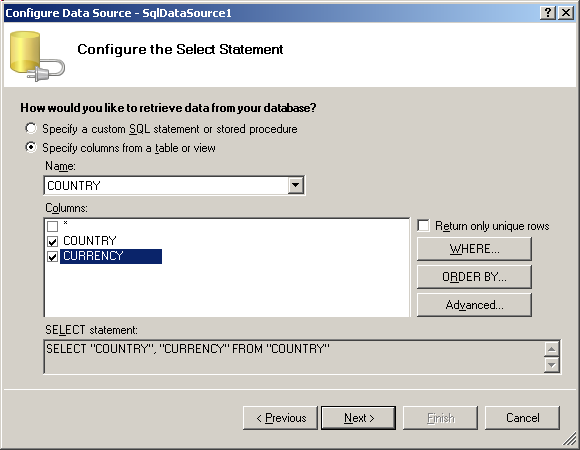 select this connection, of course, click "Next", "Next", and in the Sql Request dialog setup the COUNTRY table, click "Next" and "Finish"
If our connection string is not correct, we will receive the following error: "Borland.Data.TDBXError: C:\programs\us\db\blackfishsql\_dataemployee_2.jds database not found or fileName property set to null." 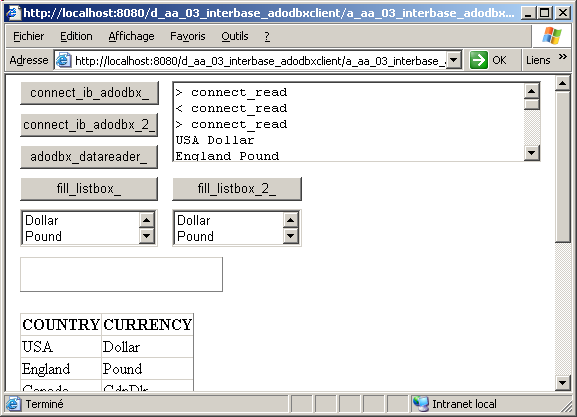 Displaying the data with an AdoDbxDataReader, and databinding this to a tListBox behaves just like it did for InterBase. All our connection parameters have been hardwired either in the DbxConnections.Ini or even in CONST in the code. This is supposed to be bad programming. Instead we should use the .XML Web.Config file to store this kind of information. In our case, if we store the connection parameters in <connectionStrings>, we will be able to grab the parameters back in our code. 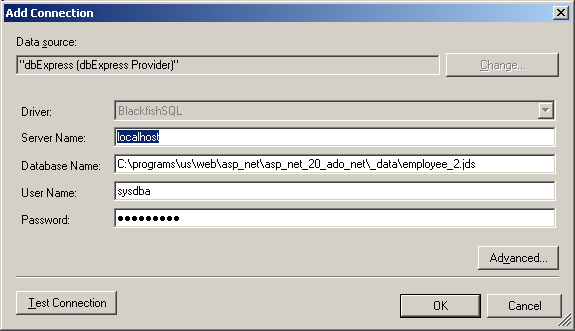 select "Project Manager | Web.Config"
For Blackfish, the parameters are quite easy, host, file name, user and password. 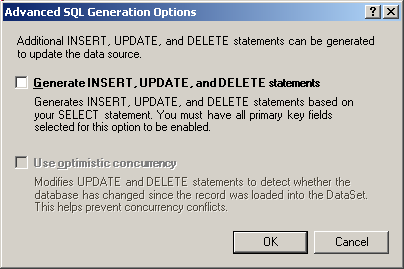 But for Interbase, or Sql Server, nobody in his right mind would ever dare type those parameters by hand. One would copy them from some place, like the Data Explorer. 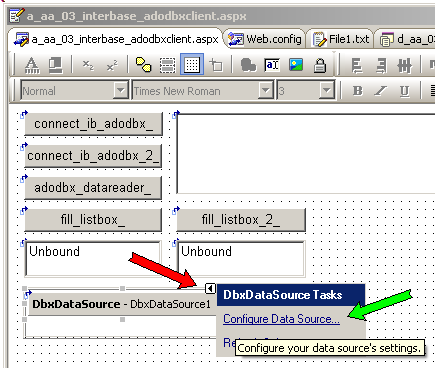 select "smart tab | Configure Data Source"
To write generic code, one solution is to use the AdoDbxClient layer which recognizes both InterBase, Blackfish, and all the other dbExpress compatible Sql engines. We let the user of our project place in Web.Config the connection string of his choice. More precisely, we prepare different connection strings, and comment them all but one out. Our code will then test the uncommented connection string, and connect to the corresponding Sql Engine. This caused the following error "Borland.Data.TDBXError: DriverAssemblyLoader property not set". We tried to add in the "References" all kind of assemblies with no success. So we simply copied the full fledged connection string, with warts and all. And it worked. 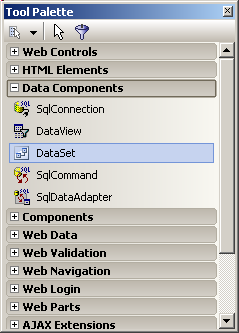 drop a GridView, select "smart tasks | Choose DataSource"
continue up to the "Configure the Select Statement"
<%@ Page language="c#" Debug="true" Codebehind="Default.pas"
select "GridView1 | smart tasks | Enable Paging"
select "GridView1 | smart tasks | Enable Sorting"
select "GridView1 | smart tasks | Enable Editing"
select "Edit" of the third row "Canada"
replace the "CdnDlr" CURRENCY name into "Canadian$" and click "Update"
Those techniques were explained in our previous Asp.Net and Ado.Net articles. Whenever we created a new Asp.Net project, when we run the project, RAD Studio automatically created an App_Data path, which is fine, and stored a 2 Meg bsql_aspnetdb.jds database in this folder, which is surprising. It turns out that this is the Blackfish implementation of the "provider model" which allows Asp.Net 2.0 to use different data sources (.XML, streams, in-memory data, database, and here Blackfish Sql database) for handling membership, profiles, roles etc. We assume this is also linked to the ASPNET_REGDB.EXE located in c:\windows\Microsoft.NET\Framework\v2.0 and which, in the first versions of RAD Studio had to be run in order to "populate the database with the provider Tables". So this is now executed automatically. 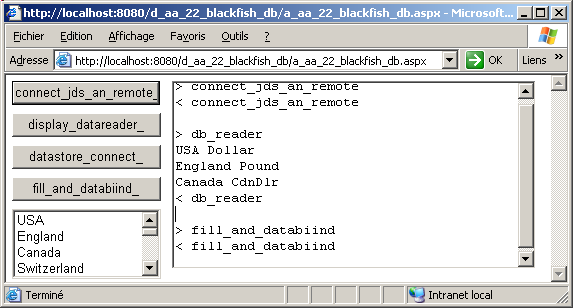 For using Blackfish Sql, we kept the default Windows Service implementation. You might want to use in-process versions or other setup. In this case, the starting and stopping of the Service or the execution of the standalone version of Blackfish using the RAD Studio BSqlServer.Exe might be necessary. See the Blackfish manual, or our Blackfish article for more information. Letting the user comment in or out some parameters which will decide how the application will work does not look very reliable to us. There was a big fuss when we went from Windows 3 to Windows 95 about the .INI files, which the users could modify using NOTEPAD, whereas the Registry was advertised as a much more safe way to parametrize the applications. And now we are encouraged to let the user fiddle the much more obscure Web.Config .XML. Granted the Web.Config is on the server, with a competent and generously paid administrator, but nevertheless, the .XML file, with no uniform presentation, wild indentation, erratic tabs and blank lines, incredibly long lines with no spaces, does not seem to be an improvement. In the November RAD Studio upgrade, Tom AVILA added an update of the Help. This included the .Net 2.0 help. Boy oh boy, was this anxiously awaited. 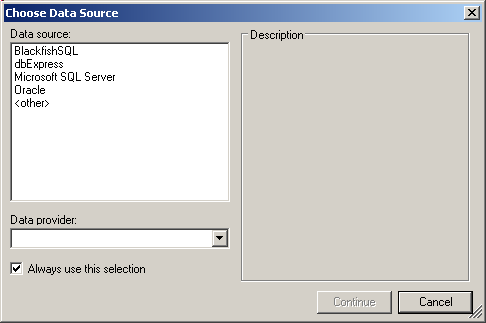 You simply cannot develop .Net applications without this help. Well, a lot. Asp.Net security, cache handling, session management for instance. And the GridView / DetailView / FormView alone would fill complete books. More detailed presentations and examples are offered during our Training sessions. for Asp.Net, it would be foolish not to use the 2.0 version. We sweated many hours to adapt the Asp.Net 1.x Portal Starter kit to Delphi 2006. Now, with the Master Pages, the navigation controls, the membership management, a similar application should be much more easy to build. So for Asp.Net development, you will love this new version. on the IDE front, there are still some parts which could use some more polishing. 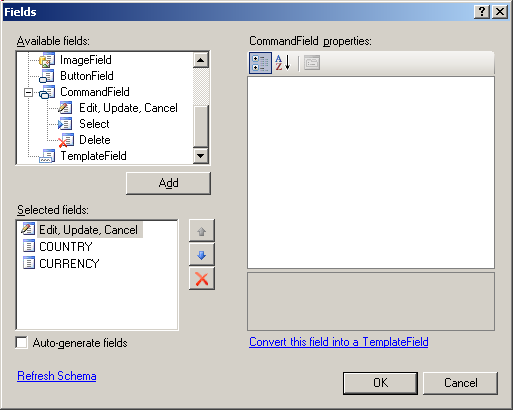 We know that with this new IDE there are LOTS of dialogs, contextual menus, icons, toolbars. Every day we discover another one which was sitting there smug under our nose . However, in the database area, there are too many different versions of the same kind of dialogs: some have connection string editors or not, other allow you to generate the request or let you type in a string etc. in a similar area, it is sad that the names were not normalized (sometimes it is xxx_Reader, sometimes xxx_DATA_reader, sometimes we have to call xxx_reader.Columncount, another time xxx_reader.Fieldcount). Certainly there is the weight of the legacy CLASSes and the fact that CodeGear has to live with the Microsoft naming schemes. 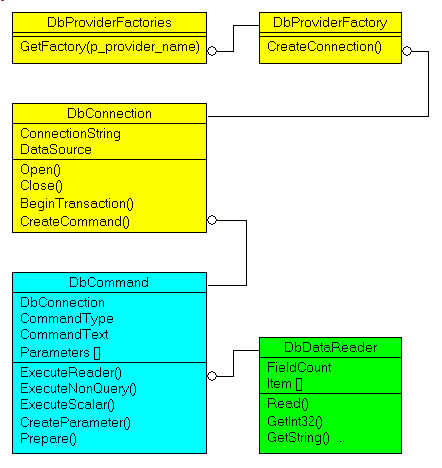 In any case, this is one of the reasons why we draw UML Class Diagrams which can be used as quick cheat sheets. are self-contained: you will not need any other product (unless expressly mentioned). You may use another path, of course, but will have to change the database path names (in the code and / or in Web.Config). We also offer Delphi training courses, and have added new sessions for Asp.Net 2.0.